The unreality TV version of the U.S. political race is simplifying and degrading the discussions that candidates are having during this election cycle. If you ask the Republican frontrunner what the race is about he'll reduce it down to a contest of winners and losers. Artist Vicki da Silva would agree. 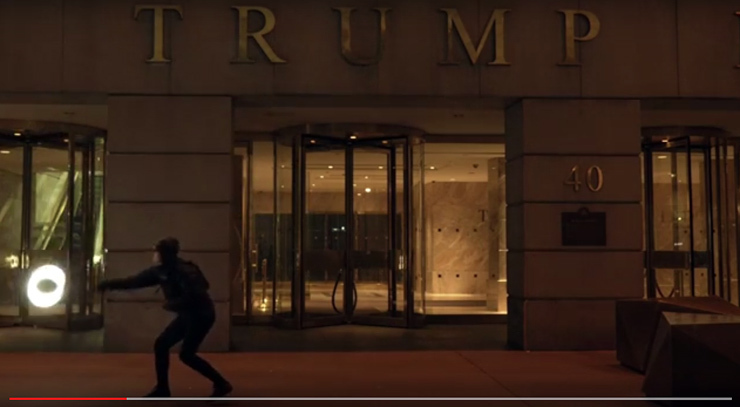 The artist did her own ode to The Donald in front of his 40 Wall Street building in New York to illustrate her sentiment. "Since Trump has a nasty habit of calling people losers, it was my way of putting it back on him using his name and logo," she says. With the new piece she reminds us of the corrosive court jester's daily attacks on any person or class of persons who do not agree with him on any number of issues. DaSilva points to comments made a few weeks ago in the run-up to the primaries in his state by former New Hampshire Republican governor John Sununu that call into question the myriad Trump stump speeches crowing about the real estate mogul's head-spinning winning. "I pointed out that he's been a loser all his life. He's had four big bankruptcies. Trump Airlines went bankrupt, Trump Magazines shut down, Trump Steaks went out of business, and when he was the owner of New Jersey Generals, they also went out business. This guy has a history of failure and losing. He's a perpetual loser," Sununu said to ABC. Says DaSilva, "The entire Republican Party is a loser party, now more than ever, in my opinion." To get the shot the artist is photographer, set director and performer. DaSilva positions a still camera on a tripod to record the movement of the lamp as she writes the text during a single-frame time exposure photograph. Important to the process is that she uses no post editing or digital alteration of the still photograph. She refers to the work as "light graffiti" and she makes prints of it to exhibit and sell. Truthfully, she says she'd love to wheat-paste a huge version of this one on a wall somewhere. Any takers? 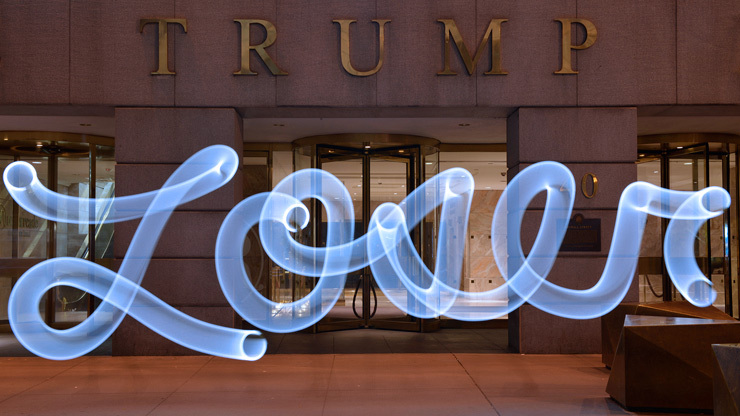 Light graffiti photograph made at 40 Wall Street, NYC by Vicki DaSilva. Video documentation by Owen Crowley.